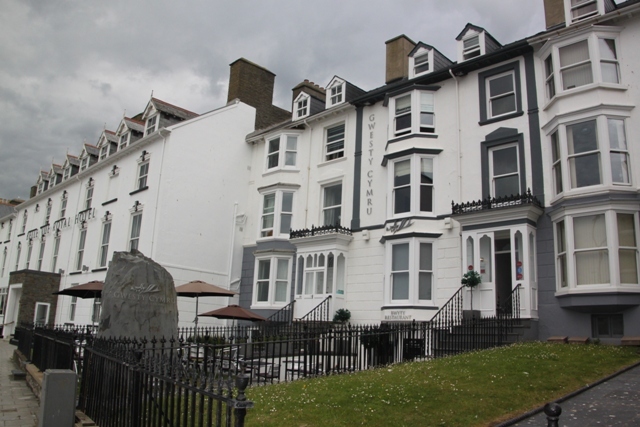 Aberystwyth – another Welsh gem – we spent one night in this relatively undiscovered small town on the far flung edges of the Welsh coastline and were enthralled by the outstanding natural beauty. 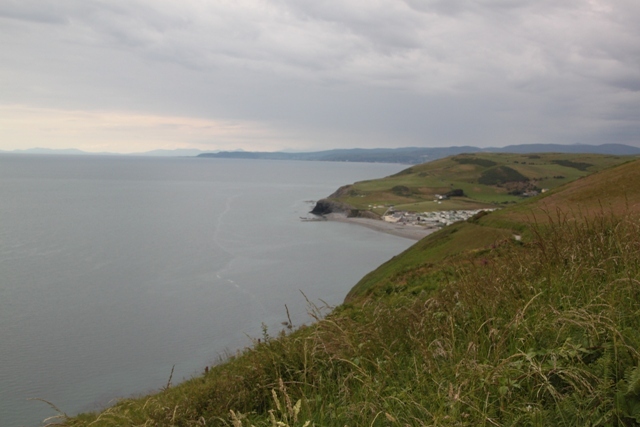 With the Cambrian Mountains to the east and a jagged coastline it was unspoilt and just gorgeous. Lying on the long sweep of Cardigan Bay the curving promenade and two lovely sandy beaches did it for Son, for me it was all about those colourful seafront Regency terraces. An internet trawl for accommodation just before we left was starting to look fruitless. Plenty of places to stay, but everything looked just a bit “seasidey” old fashioned/faded/dated. Then, at the last minute I stumbled upon the website for Gwesty Cymru. Lucky find. This place ticked all my hotel boxes and looked perfect. A lovely old house on one of those gorgeous terraces, inside it had been renovated and promised all mod-cons. We were not disappointed. It was charming – those renovations had been sympathetically done, it had slate floors and loads of natural materials and you just got the feeling this had been a labour of love. There are only eight rooms, we booked very last minute so didn’t have a choice and didn’t have a sea view. That didn’t matter we spent very little time in the room. 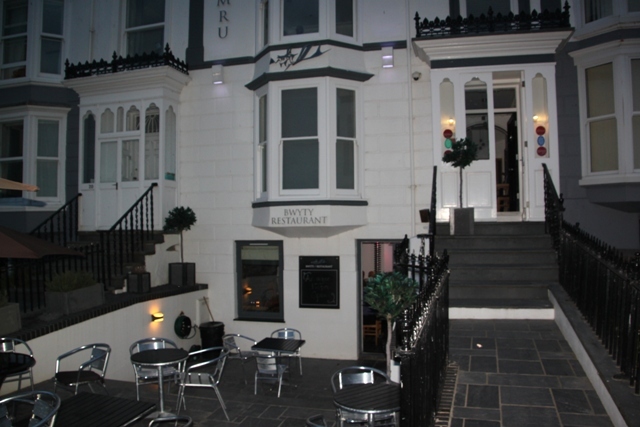 The very friendly owner helped us drag our bag up the spiral staircase to the first floor – no lift here. The room was small but perfectly formed, everything was top quality from the radiator to the light fittings to the bed linen. A bit hot during the night, the owner had left two fans and we kept the window open which cooled everything down with a refreshing sea breeze. The room had tea/coffee making facilities, free WiFi and a huge bathroom – actually almost twice the size of the bedroom with lovely tiling and an enormous shower. We set out to explore the town – the hotel was slap bang in the middle of everything so full marks for location too. 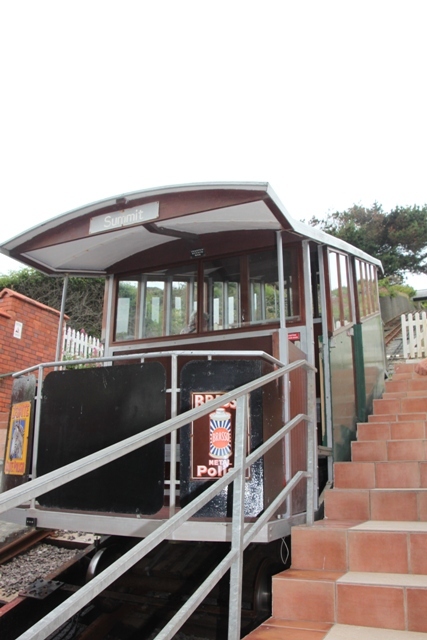 Right at the edge of the promenade is the cliff railway – the largest one in Britain. We just made it for the last train up the hill before closing time and could have taken it right back down again but decided against this, opting to make our way back to the bottom on foot. We were the only passengers and the only people at the top. The railway opened in 1896 and was originally water balanced. 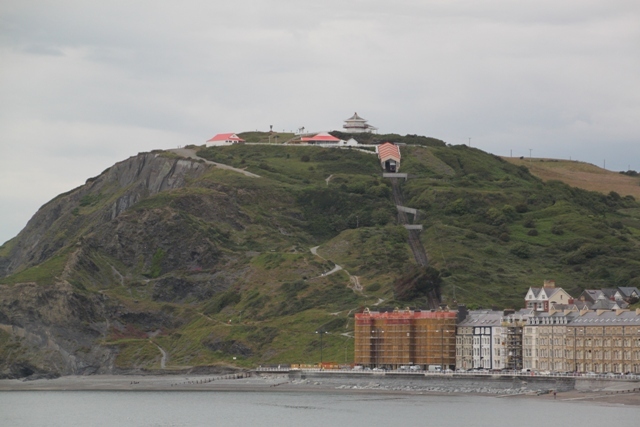 It climbs steeply to the top of Constitution Hill where we gushed over the views of the coastline. 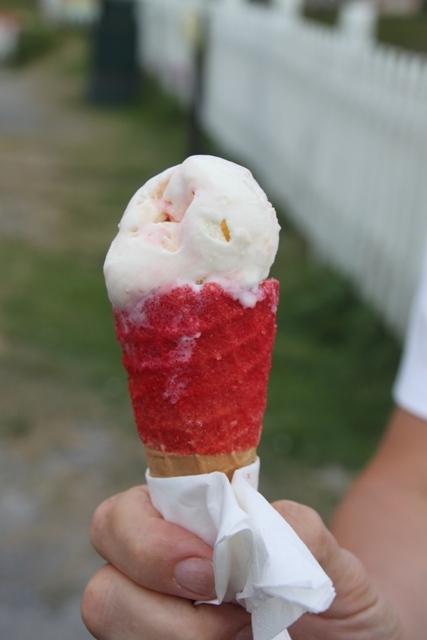 We found a Camera Obscura (closed) and a cafe (closing) but managed to squeeze in just before they shut for scrummy sherbet ice-creams. The walk back down was a little steep and a little rough underfoot but worth it for those vistas. We walked right to the opposite end of the town – great views back to the railway – to check out the castle ruins. A Norman castle, once the finest in the land but now crumbling, we found lots of interesting stones and places to clamber over and explore. 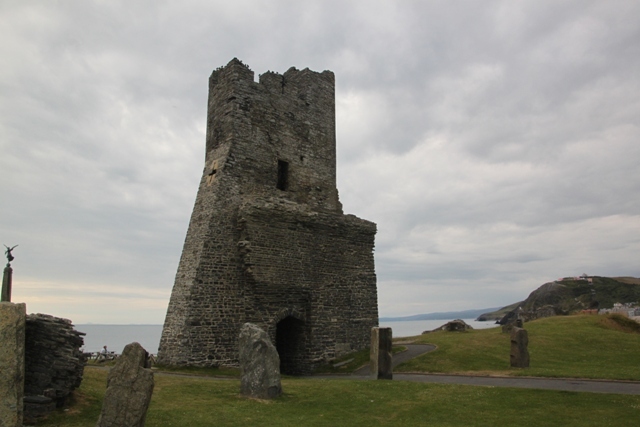 Husband remarked we have often paid to see lesser ruins – this is an Aberystwyth must-see. The views over the sea are none too shabby either. A student town, during our visit it was the start of the summer holidays so things were fairly quiet. We discovered a reasonable choice of places to eat but decided to dine in our hotel. The basement level had a bijou restaurant with a small number of tables, quaint decor, friendly service and outstanding food. We feasted on gingerbread rack of lamb – fabulous presentation and mouth wateringly delicious, in fact we were in agreement this was the best food we’d had on our Welsh trip. Husband spied the man next to us with the restaurant’s take on a Scotch egg and was intrigued. When he spotted that on the breakfast menu next morning it was a no brainer. Filled with black pudding and other goodies it was unusual and super tasty. The full Welsh breakfast was tasty too and came with laverbread. Curious to try this Welsh speciality it was an experience, let’s just say I don’t think we’ll order it again. We headed back to our car – no parking at the hotel but there was ample space on the street and it was free overnight. We did a double-take when we saw it had virtually changed colour from blue to white. The seagulls had been seriously busy all night and had pooped every car in sight – I’d never seen anything quite like this. Still, a small price to pay for a lovely stay in a great little seaside town. My husband is a big fan of Scotch eggs and of black pudding so I will have to tell him about that combination. It looks like another really interesting place to visit and you certainly pack a lot into your days. That’s our kind of travel too which must be one of the reasons your blog always appeals to me. Those Scotch eggs are making me drool just thinking about them – if you ever see anything like that tell your husband to go for it Laura! Aberystwyth is a bit off the beaten track but was really lovely, hardly any people around, loads to see and a stunning setting. Jam packed days while away are always our thing! That’s such a sweet town. Beautiful!!! We loved it – right by the sea and full of character. Only thing missing was sunshine!! This city look so charming! It really was Lauren – small and perfectly formed, gorgeous views everywhere too! It was great – sandy beaches and sea – just no sunshine!! A good reason to go back in the summer? Great post and pictures. How do you find all of these little out of the way places? This was another of those lucky finds George!! We needed someplace to stay in this area and just picked it because it was by the coast and had several hotels!! 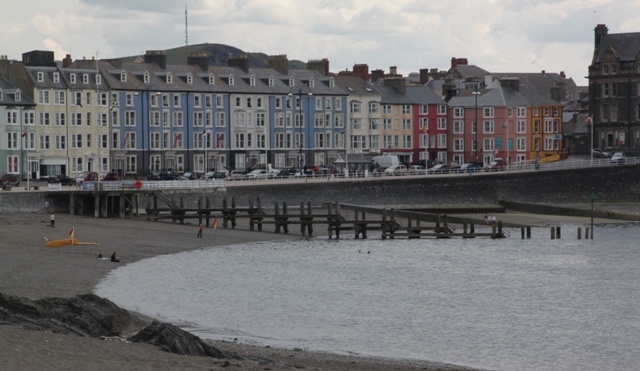 This one we can just about manage – it’s this place that would definitely get me – Llanfairpwllgwyngyllgogerychwyrndrobwll-llantysiliogogogoch – where would you start!! After Scotland this summer, we will head to Wales I think. there are so many interesting places I didn’t even known they exist until I read them on your blog ! 🙂 What’s your favourite region in the UK ? 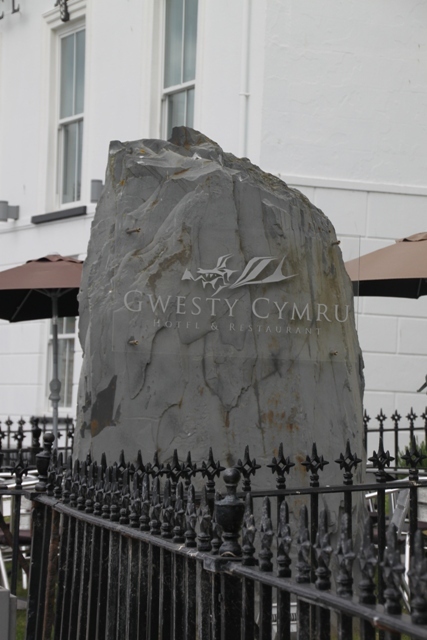 Wales is great – I had only really ever been to North Wales and Snowdon before this trip so found lots of great new places!! Don’t know what my favourite UK region is – sooo hard to pick. I love Scotland and the highlands but in the summer I love Devon and Cornwall too. Then there’s Ireland – how can you pick!! Scotch egg filled with black pudding? I’m booking my flight as we speak! 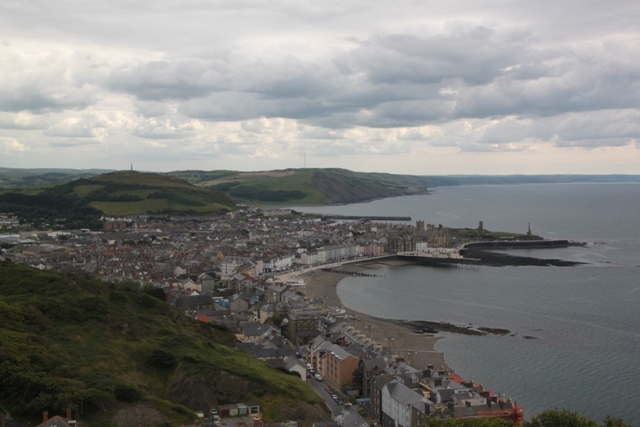 Aberystwyth is one of the settings of the novel The Fall of Giants by Ken Follett. I’ve always wondered what it really looked like, It’s quite pretty. It was so delicious – the best Scotch egg ever!! Didn’t realise that book was partly set here – makes me want to read it! Loved Pillars of the Earth so this one sounds good too!! 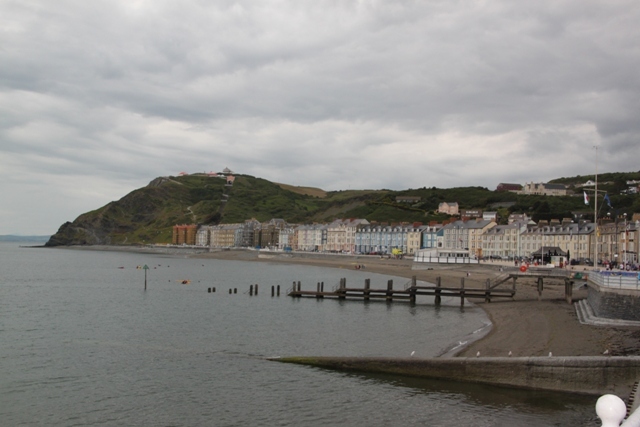 Lovely post Joy – I went to Aberystwyth as a child on family holidays so it’s a trip down “memory lane”. I can’t really remember much of the town though but the coastline looks familiar! The breakfast sounds intriguing – Scotch eggs filled with black pudding! The little hotel you found looks a real gem too 🙂 Have a lovely weekend! 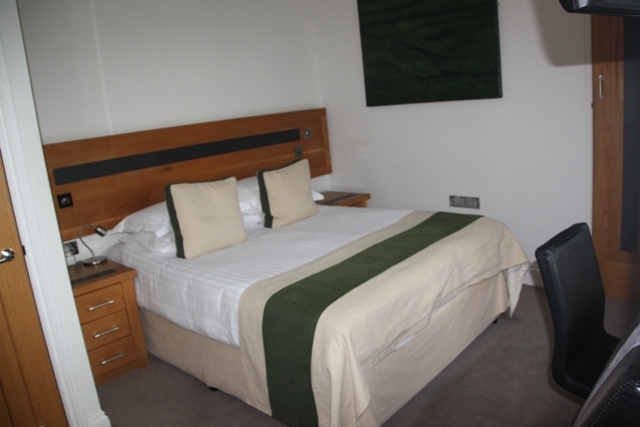 The hotel was lovely Rosemary – small but perfect for us and those Scotch eggs still make me drool. 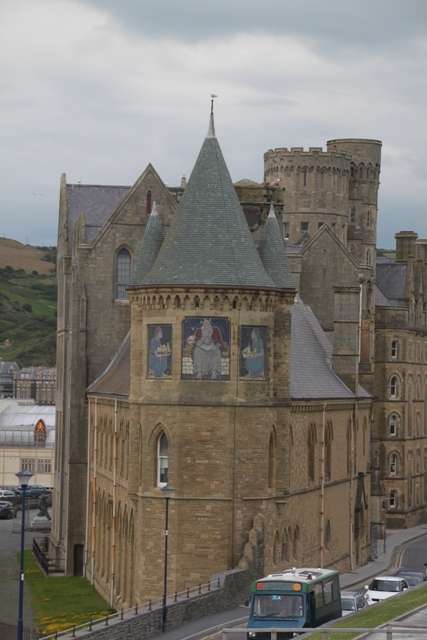 We didn’t quite know what to expect in Aberystwyth but had such a lovely time there. 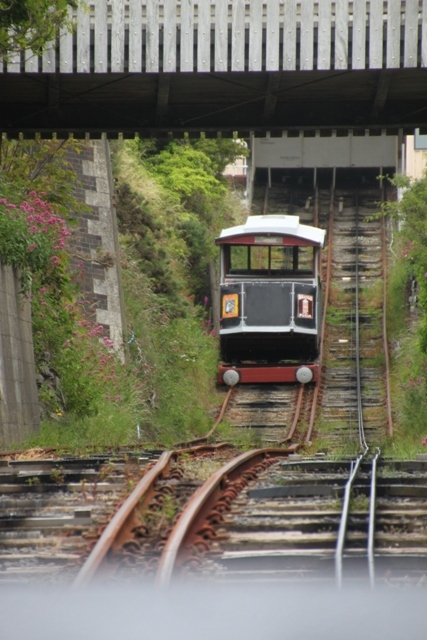 The cliff railway was my highlight – the views were incredible. Your trip is getting ever closer now – hope your weekend is a relaxing one!! Thanks Kamila for coming along! It was a lovely seaside place, even if the sun didn’t make its appearance!! Have a great weekend. Had some lovely walks in Rheidol Valley between Aberystwyth and Devil’s Bridge, the forests in Autumn are filled with a spectacular array of colour. Unfortunatly I’m at Bangor Uni so, by tradition, Aber is our sworn rival. We visited in summer – gorgeous but would love to go back in autumn time. That area sounds great for walking!! Old rivalries are not a bad thing!